New church plants aside, it’s very easy to make the church all about the pastor by making everything revolve around his leadership. He makes every weighty decision. But that’s not wanting to be a pastor. That’s wanting to be a pope. If the lead pastor gets hit by an asteroid on Monday and the church boards its doors on Sunday, the head honcho has failed. Unfortunately, many leaders who initially aim to lead gospel-centered churches often, years after planting, still find themselves a pastor-centered church. For example, a pastor-centered church is one where you never really pass the ball of leadership to others. You make all the final calls, remind everyone the buck stops with you, and spend more time making decisions instead of developing decision-makers. You’re always working in the ministry than on the ministry. Again, it’s one thing to endure this type of pastor-centeredness when you are starting a church. Honestly, it’s likely necessary for more reasons than this post will allow. But if, over time, you’re not willing to expand the circle of leadership responsibilities to include others (and yes, this includes preaching), you may be succumbing to the temptation of indispensability. Indispensability whispers to us that things won’t get done without our involvement. It betrays us into thinking that if we’re not in the middle of everything then somehow we’re not being a good pastor. It hamstrings our ability to entrust things to others for collective good of the church. It plays on our insecurities grinding down the health our leadership. Frankly, the feeling of indispensability bloats the ministry of a pastor to a size of idolatrous proportions. It can also alienate you from your family and your marriage. which remind them that pastoral ministry is measured just as much by what you pass down to others as what you keep for yourself. That’s one reason why my church has spent countless hours and tons of resources putting together a Leadership Development Program that keeps us in a healthy rhythm of pouring into leaders “for the work of ministry.” It’s why we make the pulpit a team endeavor, eschew personality-centered communications, and structure leadership in such a way that distributes many responsibilities of the lead pastor while still having a very real (and very fine) lead pastor. 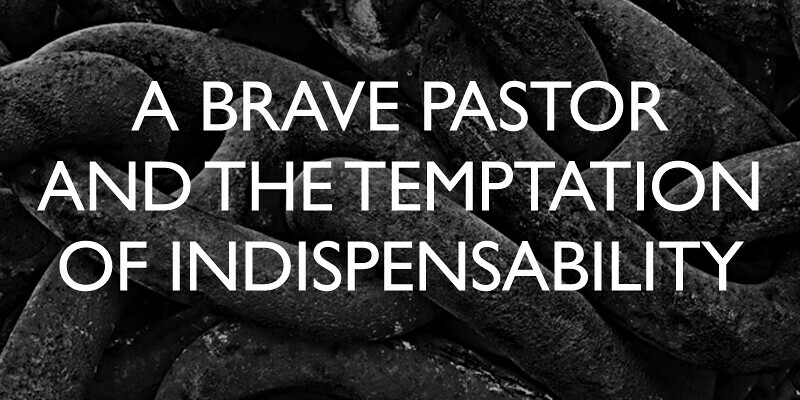 Know this, the temptation of indispensability is very real pitfall for the heart of a pastor. Brave ones fight against it.